Akron-Native Pianist Kofi Boakye returns back to the legendary Apollo Theater in Harlem for the top dog semi-finals of Amateur Night at the Apollo. If Kofi wins this round, he will advance to the Super Top Dog finals held on November 27th. Akron-Native Pianist Kofi Boakye returns back to the legendary Apollo Theater in Harlem for round 2 of Amateur Night at the Apollo. If Kofi wins this round, he will advance to the Top Dog semi-finals held on May 15th. Award-winning Pianist Kofi Boakye will be performing at City of Joy’s 10 Year Anniversary Gala held this Friday, March 8th at City of Joy in Akron, OH. Akron Pianist Kofi Boakye has been chosen by The Apollo Theater to perform for Amateur Night at the Apollo. For tickets and more info, click here. Award-winning Pianist & Miller South Alum Kofi Boakye returns to Miller South to preview the “Kofi: Made In Akron” Film Premiere & Show Fundraiser at Tangier Entertainment & Events Center at Tangier on January 31st! AKRON, OH – (Jan. 10, 2019) Community members are rallying beside Kofi R. Boakye, a 19-year-oldaward-winning keyboardist, songwriter, and producer on Thurs., Jan. 31, 2019, at The Tangier Event & Entertainment Centerto support Kofi and his financial efforts as he prepares for college at Berklee College of Music. Getta Kutuchief and Nicole Mullet are thrilled to host a fundraiser for Kofi Boakye as he prepares to continue his education at Berklee College of Music in the fall of 2019. Kofi has set-up a a tax exempt 529 savings plan he has been contributing to and now we're asking the community that has come alongside his work since he was 8 years old to rally a kid from Akron. Akron School of Music’s Jazz Program, making him the youngest African-American pianist to ever be accepted into a collegiate-level jazz program at the UA. In September 2016, Kofi performed at the Akron Civic Theatre, making him the first teen pianist to ever headline a show there. Though many of his experiences stem from within the U.S., Kofi has had the opportunity to refine his talents on the world stage, touring Germany and Prague with the Miller South Show Choir. While music remains at the core, Kofi’s accolade extends beyond the big stage. In 2014, President Barack Obama and the White House awarded Kofi with the “President’s Education Award for Outstanding Academic Excellence”. Tune into Cleveland 19 News on CBS WOIO as Award-winning Pianist Kofi Boakye makes an appearance on their Sunny Side Up Morning Show in promotion for his highly anticipated Kofi: Made In Akron Film Premiere & Show! Join us on Wednesday, January 16 for SMARTS new family orientation, 5:00 – 5:30 with a presentation by Kofi Boakye from 5:30 – 6:30 pm. Kofi Boakye, a high school student in Akron, is a musician, public speaker, entrepreneur and soon to be a student at the Berklee School of Music in Boston. His story is inspiring and will resonate with SMARTS students, families and friends. He is 2014 White House Excellence Award© Recipient and 2018 NAACP ACT-SO National Medalist. See more here http://kofibmusic.com/about/. You don’t want to miss this! Award-winning Pianist Kofi Boakye will be performing at the John S Knight Center for the 37th annual Holiday Tree Festival on Friday, Nov. 23th @ 2pm. Free admission! 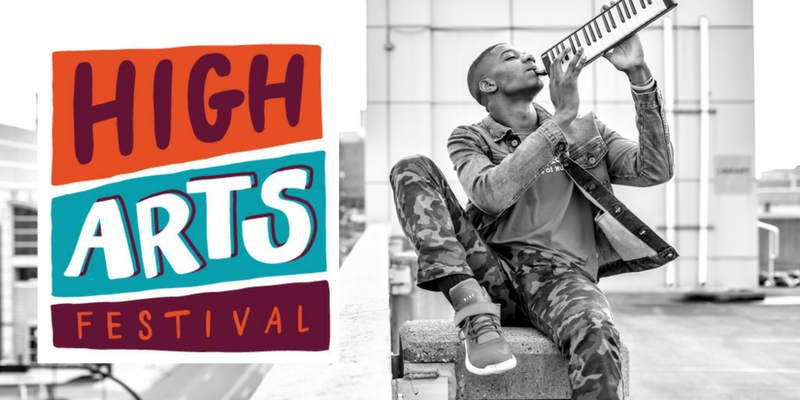 2014 White House Excellence Award Winner and 2018 NAACP ACT-SO National Medalist Kofi Boakye competes in the High Arts Festival for the first time! Admission is free and open to all! Click here for more info. 2014 White House Excellence Award Winner and 2018 NAACP ACT-SO National Medalist Kofi Boakye kicks off BMW of Akron’s Saturday Music Showcase. Boakye is an 18-year-old Award-winning keyboardist, songwriter, and producer born in Akron, Ohio. 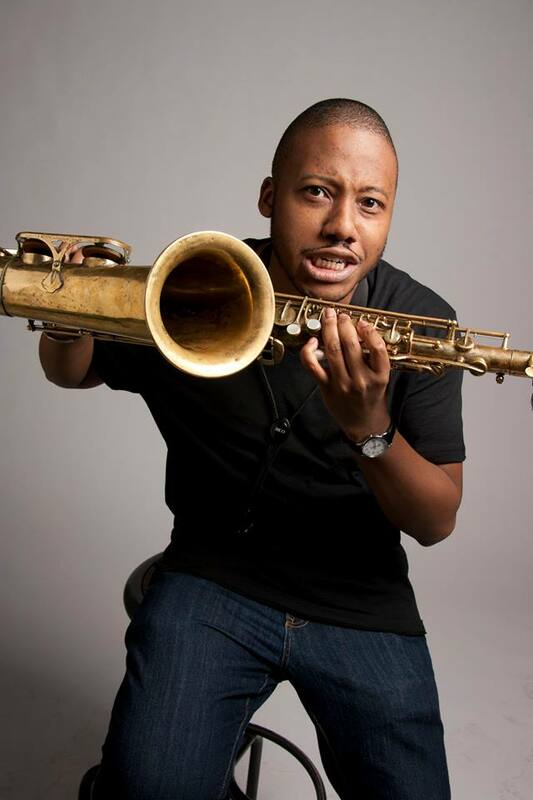 Kofi has gathered musical experience from myriad venues across the United States. Kofi has been interviewed by 8x Emmy Award Winner Romona Robinson of Channel 19 Action News as well as appeared in multiple magazines, newspapers and local broadcasts across Ohio. Though many of his experiences stem from within the U.S., Kofi has had the opportunity to refine his talents on the world stage, touring Germany and Prague with the Miller South Show Choir. At the age of 15, Kofi was accepted into the University of Akron School of Music’s Jazz Program, making him the youngest African-American pianist to ever be accepted into a collegiate-level jazz program at the UA. In September 2016, Kofi performed at the Akron Civic Theatre, making him the first teen pianist to ever headline a show there. 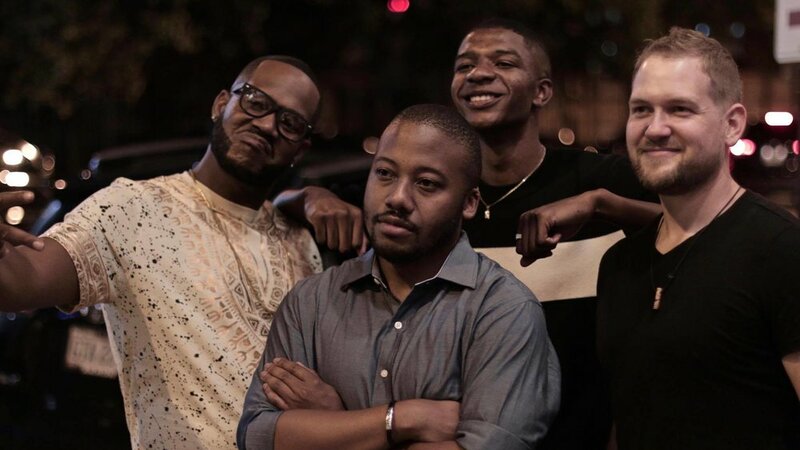 Kofi continued his upward path of music production and songwriting being the music producer for the Emmy Nominated “Why Not Akron?” Short-film. While music remains at the core, Kofi’s accolade extends beyond the big stage. In 2014, President Barack Obama and the White House awarded Kofi with the “President’s Education Award for Outstanding Academic Excellence”. In 2018, Kofi won the Silver medal in the NAACP ACT-SO National Competition; making him the first person from Akron to ever win. Currently, Kofi is a newly minted high-school graduate and attends the University of Akron studying marketing. He will attend Berklee College of Music in the Fall of 2019. Admission is free and open to all customers of BMW of Akron. Award-winning Pianist Kofi Boakye brings his energy-filled act to the stage in honor of his cousin, the late Kimyata D. Cooper Jr. for the Hoop For Coop Cabaret Comedy & Jazz Event! Tickets available here. In a tribute to one of his biggest life motivations, Kofi Boakye performs a solo piano show at the Akron Art Museum's Annual MLK Day Celebration for families in the Greater Akron Community. For more info, visit www.akronartmuseum.org. All shows are available for entry with the purchase of a First Night Akron 2018 Button (available at http://www.downtownakron.com/explore/first-night-akron). *All merchandise will be available for purchase at this event. Award-winning Pianist Kofi Boakye will be performing at the John S Knight Center for the 36th annual Holiday Tree Festival on Friday, Nov. 24th @ 2pm. Free admission! 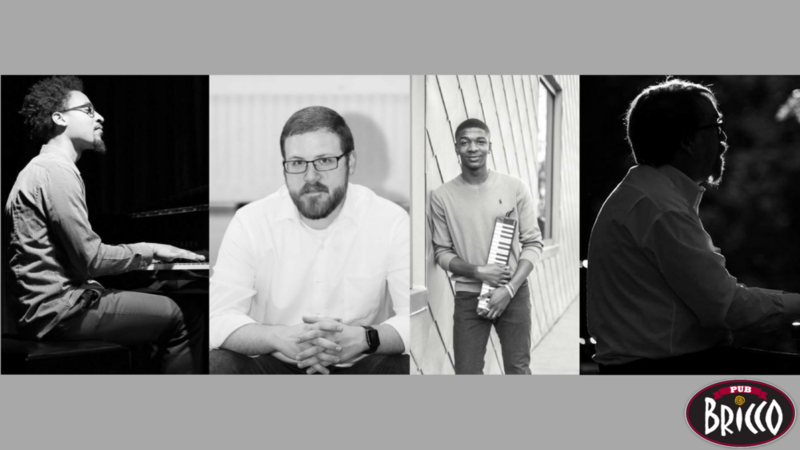 Award-winning pianist Kofi Boakye plays alongside Akron-based saxophonist Justin Tibbs as he debuts his newest band, "The JT Electrik Group", before a high energy crowd at the None-Too-Fragile Theatre inside of Pub Bricco. November 1st at Pub Bricco. Doors open at 6pm, Show at 7pm. Free admission. 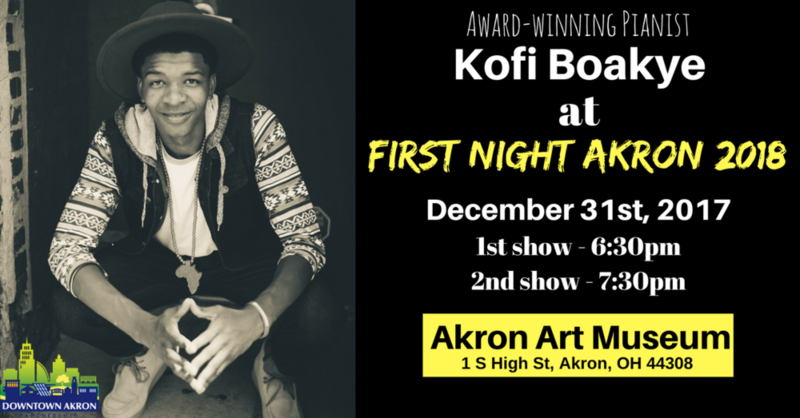 After a nine month hiatus from performing, 17-year-old Akron-born keyboardist and multi-instrumentalist Kofi Boakye makes his return for a night of music inside of the “None-Too-Fragile” Theatre at Pub Bricco. Boakye will be featuring a diverse sequence of music from jazz standards and popular modern-day songs, to original music from his newest EP, “Made In Akron”. Joining the Bricco stage with Kofi will be Jeff “Chochi” Law on drums, Matthew DeRubertis on bass, and Marquis Brown on auxiliary keyboards. Bring your friends, bring your loved ones, and most importantly...bring your energy! Doors open at 6pm. Show begins at 7pm. FREE ADMISSION! In honor of his friend Summit County Executive Russ Pry who died in a battle with cancer last year, Award-winning pianist Kofi Boakye will perform at the GAC's 110th Meeting! Kofi Boakye shares his story live during PechaKucha Akron Vol. 6 at First Night Akron!